DEET is the tried and true reigning champion of mosquito repellents. It has been in use since the 1940s. DEET is endorsed by the World Health Organization and almost every local health organization as the most effective mosquito repellent. But there is a newcomer threatening to dethrone DEET. Picaridin has been available since 1998 in Australia and Europe and came into use in the U.S. in 2005. It has several potential advantages over DEET and is reported to be just as effective. Recently, there is growing discussion of the values of Picaridin vs DEET. DEET was developed in 1946 by the United States Army as a way to keep troops safe from mosquito borne illnesses. Before long it entered into use by the general public. It was far more effective at repelling mosquitoes than any compound developed before it and is responsible for saving millions of lives around the world. Because DEET has been in broad use for over 70 years, there is an incredible amount of data on the safety, efficacy, and environmental effects of DEET. It is recommended by the World Health Organization (WHO) and almost every other national and local health organization. DEET is a synthetic compound, N,N-diethyl-m-toluamide. It has been shown to be effective at repelling mosquitoes from one hour up to six hours or even longer, depending on the concentration that is applied. DEET has been used billions of times over its history, with an incredibly low rate of adverse effects. However, the adverse effects that are reported are usually apparent only with high concentration of DEET. For this reason, using a lower concentration and reapplying more frequently may be preferable to using the strongest possible concentration. DEET does have its drawbacks, though. Although rare, there are some adverse effects reported with the use of DEET. Some people report skin irritation or a rash when applying DEET, especially in high concentrations. Others report an aversion to the smell of DEET. Also, while DEET is safe for use on human skin, it is not safe for use on all materials. DEET is known to dissolve some plastics. It can also damage certain synthetic materials, including spandex, rayon, and vinyl. A common issue that may arise from this is damage to sunglasses, which are often made of plastic. If a person applying DEET gets some of the chemical on their plastic sunglasses, it should be cleaned immediately. If it is not cleaned, it can cause permanent etching or other damage. Similarly, if an individual is wearing spandex or rayon, common clothing choices in the hot months of mosquito season, their clothes could be damaged if DEET gets on them. Another drawback to DEET is the way it feels on the skin. Many people say that it makes their skin feel greasy after application. Others are bothered by the smell of DEET. This becomes worse with higher concentrations of DEET. So while DEET remains one of the most effective ways to repel mosquitoes, it may not always be the most pleasant substance to work with. Picaridin, also known as icaridin, is a synthetic chemical that is produced to mimic a natural chemical called piperidine. Piperidine is found in the species of plants that includes common black pepper, the type you might have on your dinner table. However, it should not be confused with a natural derivative, since it only mimics the natural substance. Picaridin was developed by the German drug company Bayer in the 1980s. However, it didn’t come into use in Europe and Australia until 1998. Officials in the United States were even slower to adopt picaridin. It was not approved for use in the U.S. until 2005, nearly 20 years after it was first created. The slow adoption of picaridin is due in part to the need to test the compound for safety. As with any new drug or chemical, it is hard to know the long-term effects right away. However, there have been numerous studies on lab animals, including exposure to high doses of picaridin over extended periods. These studies have shown picaridin to be mostly safe. In the United States, the EPA has determined that picaridin ins safe for use on human skin. When it comes to use on children, few studies have focused specifically on this demographic. However, there is little reason to believe that if affects children differently than adults. The Center for Disease Control and Prevention (CDC) recommends not to use any type of insect repellent on babies less than 2 months old. This includes DEET and any other type of repellent. The CDC does recommend picaridin for children over 2 months old and for adults as a safe and effective mosquito repellent. The EPA also considers both DEET and picaridin to be safe for use during pregnancy. There is no evidence that either compound has a negative effect on either the mother or the fetus. Picaridin does not seem to have any serious negative effects on the environment. It may be moderately toxic to some fish, but only in large doses. Picaridin is considered non-toxic to birds and other land animals. It may bind to soil, but it doesn’t go much farther than that. Bacteria in the soil break down picaridin and it does not last long enough to leach into groundwater. There have been some studies that have detected the presence of picaridin in wastewater. However, there is no measurable picaridin in water that has been treated by a wastewater plant and reintroduced to the environment. Picaridin has become the best selling mosquito repellent in Europe and Australia. And it is not hard to see why. Picaridin has been shown to be just as effective as DEET at repelling mosquitoes. But it also has several distinct advantages over DEET. First of all, picaridin does not have the same greasy feel as DEET. Once picaridin is applied it is odorless and non-greasy. It also does not damage plastics or other synthetic materials like DEET. Picaridin has been shown in many studies to be just as effective as DEET. That being said, it has not been shown to be more effective than DEET. So for sheer mosquito repelling power, the choice is really yours. The one possible advantage of DEET is its long history. Scientists have plenty of data on which to base the safety of long-term exposure to DEET. Picaridin just doesn’t have that same data available. However, there is currently no reason to believe that picaridin has any negative long-term effects. The advantages of Picaridin mostly have nothing to do with its repelling power. Some people find it less greasy than DEET. It is also easier to apply because you don’t have to worry about getting it on plastic or synthetic materials. Some studies have shown that at low concentrations picaridin lasts longer than DEET, but once the concentration increases, it has similar effectiveness times to DEET. The choice is really yours. 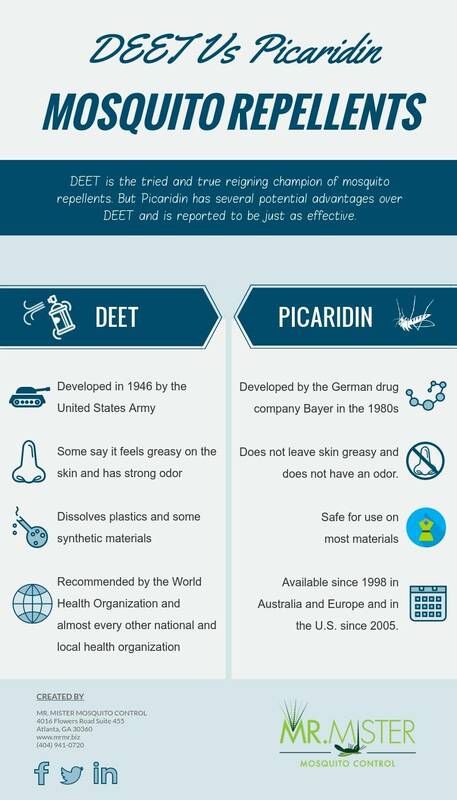 There is no reason to believe that picaridin is inherently better than DEET or any worse. An increasing number of common and widely available insect repellents in the U.S. now contain picaridin. Cutter Advanced, Sawyer Premium, and Repel Smart Spray are a few well known brands that include picaridin. The market share is not as great as DEET, but it is growing. In addition to using mosquito repellents, it is also possible to control mosquito populations so that less repellent is necessary. One common way to control for mosquitoes is to use sprays that kill mosquitoes and prevent reproduction. Mr. Mister Mosquito Control offers two main options for creating a mosquito free zone around your home. Our ClearZone Misting Service uses a solution that sticks to the underside of the foliage around your home. The solution creates protection that lasts 21 days and also inhibits reproduction. 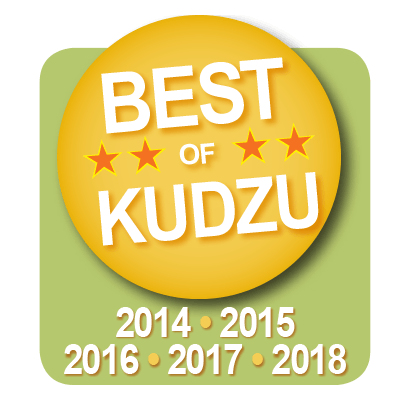 If you want to avoid repeated visits and reapplications throughout mosquito season, you can opt for one of our Automated Misting Systems. This system is installed on your property much like a sprinkler system. Once installed, it automatically releases mosquito fighting spray at appropriate intervals. You can learn more about our services by contacting us on our website or calling us at (404) 941-0720.